After being down in Atlantic City and along the shore and seeing how so many people were affected by Sandy, I decided to write about another big storm that hit the northeast on Thanksgiving Day 62 years ago. This storm had everything, high winds, heavy snow, and very cold temperatures all the way into the South. It started as a strong upper level low pressure system moved over the Great Lakes area. 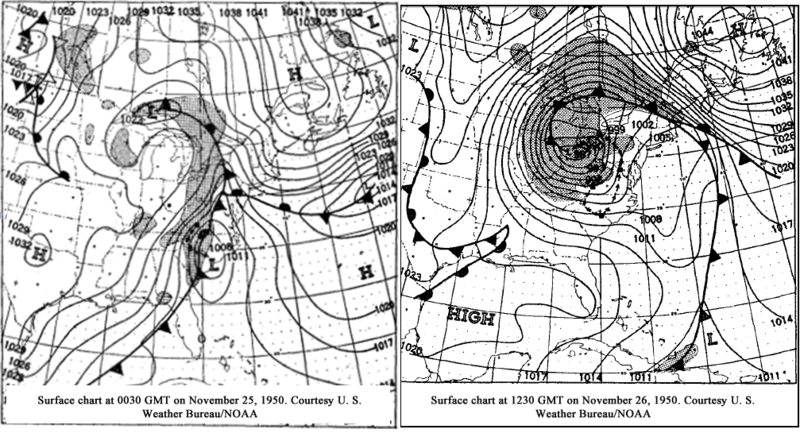 This set the stage for a surface low pressure system to develop over the Carolinas on November 25th which rapidly strengthened as it moved up the East Coast, then inland through MD and into Ohio by the 26th. This storm pounded the southeast first, leaving plenty of crop damage with temperatures plummeting to a low of 3 degrees in Atlanta, GA. With a strong 1049 mb high over Labrador and the storm strengthening as it moved north and northwest, destructive winds accompanied the system. Sustained winds of 50-60 mph were reported in the Mid-Atlantic and Northeast, with an amazing 94 mph gust in New York City and a 110 mph gust in Concord NH! As the storm moved over Ohio, it dumped massive amounts of snow along with causing blizzard-like conditions. Pittsburgh and Erie received close to 30 inches of snow, along with Youngstown, Ohio. It brought most of the Northeast’s businesses to a halt much in the way Sandy did. Sadly, the storm caused over 300 deaths and up to 1 million power outages, in the end causing an estimated $66 million in damage. The storm also had an effect on the famous Big Ten rivalry between Ohio State and Michigan. With a conference championship berth on the line, the two teams played through heavy snowfall and 30 mph sustained winds. Both teams punted a total of 45 times, even on first down, and the only touchdown came with a blocked punt and recovery by Michigan. Amazingly, here is footage of the game, which is a must watch. In the end, this storm ranks as one of the most powerful to hit the Northeast, one that could even be compared to the likes of Sandy in some respects.